One of the great things about living in a public state, especially a serious public land state like Idaho, is the backcountry quickly available. This is uplands today at 4:30 PM above Lead Draw, a 5-minute drive from my house and a one hour hike. Nice shots, Ralph. What lens and body for the first one? It was a Nikon Coolpix 8800. It has very good image stabilization. I’m sorry they made the Coolpix line into style digital and concentrated on digital SLRs where you have to carry extra lenses. I spend at least one weekend deer hunting just to the immediate east of where you were standing today, in the next draw over to the north. Did you see any of the moose that are calling that area home now? Also I believe the biggest reason Lead Draw ended up being blocked off was the high school keggers that were held up there on a regular basis. The view in the photo is to the north. Everything went on in Lead Draw. Shooting in every direction, including a couple suicides and a homicide. 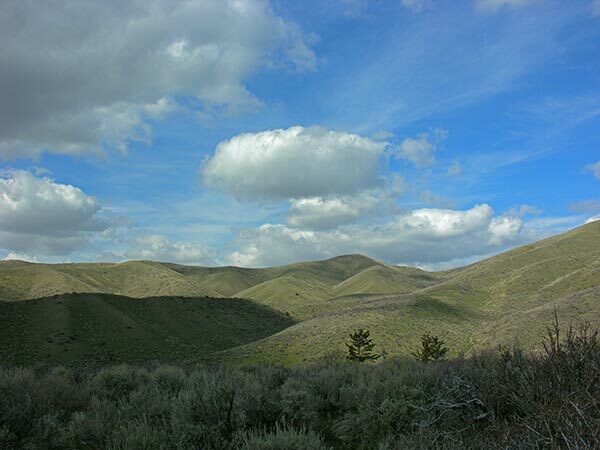 Hike cross-country and it wasn’t unlikely to come upon a tryst on a blanket in the sagebrush. ATVs diverted the tiny creek by breaking down the banks. There was a loop dirt road in the draw’s bottom. Now it is one wide single track with the other half of the loop revegetated. Hill climbs were starting in all directions. Google Earth shows Lead Draw as of about 3 years ago. Beaver might now be reintroduced to the drainage. That’s when the moose will come. Beaver have been reintroduced in the East Fork of Mink Creek at the bottom of Lead Draw. Last spring they cut down enormous willow trees and now there are about 5-7 ponds. 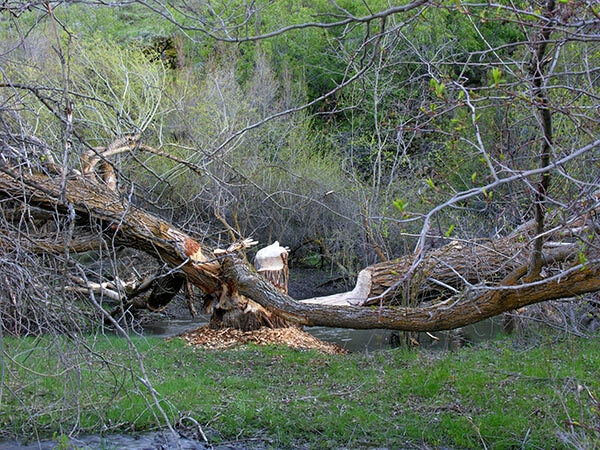 Beaver at work on the willow trees. The number of moose was up last year on what was the Pocatello (now the West Side Ranger District). I haven’t seen any moose sign at all this spring so far. So far this year is a lot drier than 2006. The snowpack is melting very early. It’s a constant battle, however. The trailhead parking lot is completely trashed today with remains of an illegal bonfire, shell casings, trash, shotgun shells, plastic bags. Actually that keeps the number of hikers down. The beginning 1/4 mile is not inviting. Actually there is one more draw between Kinney creerk and Lead Draw, doesnt really have a name and doesnt look like much from the paved road but if you park at Cherry springs and then go right accross the road you get into it. after a couple hundred yards it opens up ad is actually fairly large area. As for moose I have seen two to three in that draw or Kinney Creek for several years now. Stop by and talk to the folks that live in the last house on the right before you cross the cattle guard. They see them all the time in the creek there. I have also seen a cougar cross the road in that same place. 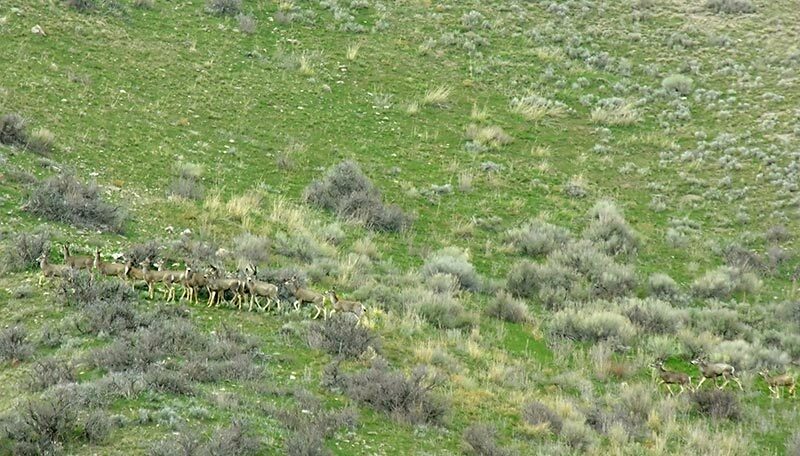 There are elk that winter in the ceders between Kinney creek and the draw I am talking about just above the hi-way most years although the light snow may not have pushed them that low this year. A few years ago I was elk hunting on Scout Mountain and on the saddle between Scout Mountain and Old Tom Mountain counted five moose in about a five acre area. One bull, four cows. In addition there are any number of coyotes, badgers, probably some bobcat too. I wish I could get over there more. You are right. I forgot about that draw, but I have been up it. It does have a stream and if I remember at least some old beaver ponds. I haven’t been to the saddle between Scout Mountain and Old Tom for about 5 years, but it would seem like a place for moose with those nearby ponds. That was an important place to me. I recall that a long time ago I was up there in a dry winter and got talking with one of the guys with me, Ron Watters, and I decided I could have fun and make some money doing hiking guides and also promote a conservation message while doing so. Last year I saw moose tracks numerous times in Valvehouse Draw and a young bull standing next to the road at the “Beaver Ponds” (began as beaver ponds, but became artificially reinforced catchment ponds when the FS lined them with rocks) on the way to Crystal Summit. Other local news. The Corral Creek trail has really become a gully with the fast snowmelt this year. I asked the Forest Service to close it completely this year and rebuild the trail. It dumps a lot of sediment into Mink Creek. I suspect they won’t. Where’s the money? I floated the Snake and Teton Riv with Ron back in the 70s. These pix make me homesick — again. These pictures remind me why I work so many hours. I am in my mid- thirties (a lady never tells) and am looking forward to the day when my back yard has no fence, and my free time has no boudary. I am part of a local wildlife trust and we go to the local common to clear brambles from public footpaths which is so gratifying and seeing these beautiful photos are just too beautiful to express in words. Just wanted to let you know that I appreciate you and your book. Thanks alot. It has become my main reference material for the outdoors. The only problem that I had with your book is durability. If you produced a leather bound book with straps that sealed it, I would definitely spend the extra $ to get it. It has become regular reading material while hiking. the extra weight is inconsequential. Again thank you so much.